When you’re trying to pack an entire apartment worth of furniture into just 130 square feet, where do you find the room for a full-sized bed? The answer, in this case, is a place you’d likely never expect: under the kitchen floor. 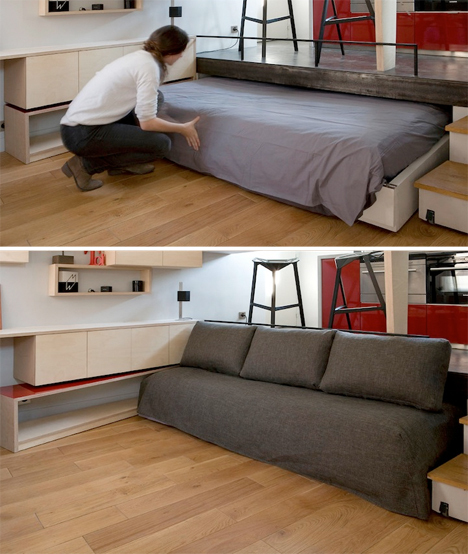 ‘Disappearing Bed’ rolls under a raised platform to go away altogether when floor space is required, or it can be pulled halfway out like a drawer to serve as a couch. 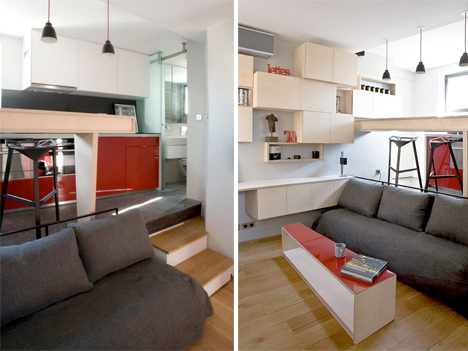 Architects Julie Nabucet and Marc Baillargeon found every possible inch of space in a tiny micro flat in Paris, hiding storage and extra functions in nearly every corner. 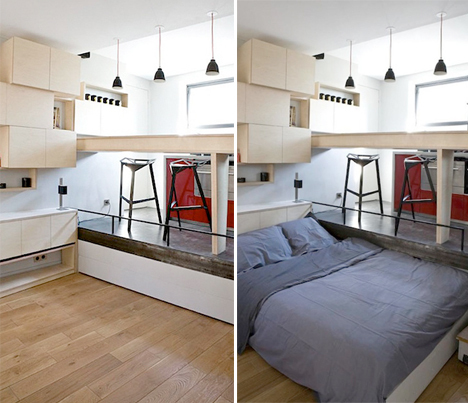 Raising the kitchen to accommodate the hidden mattress is not only an incredibly clever solution, but also makes the room feel larger by adding an extra level. A rectilinear table tucks away under a series of under-table cabinets, or can be swung out in front of the couch to act as a coffee table. Desk-height shelving that runs in an L-shape along the wall provides workspace, and staggered wall cabinets hide away clutter. 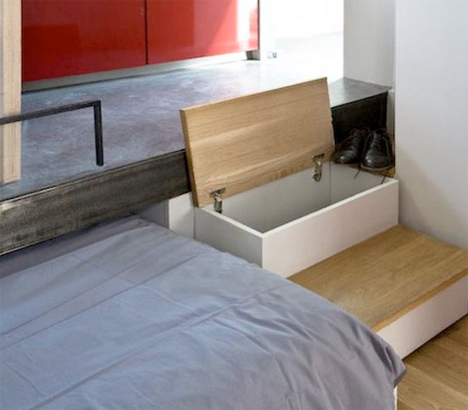 The stairs leading up to the kitchen offer hidden storage space for shoes, and the narrow bar overlooking the living space is hollow to hold magazines, books and other small items.